Long-lasting stainless steel construction resists both wear and food odor. A stainless steel shaft is complemented by the tempered stainless steel blades cast directly into the cutter for added strength. The durability of the Champion 2000+ Juicer is backed by a 5 year limited warranty on all juicing parts and a 3 year warranty on it's motor. Designed with simplicity in mind, the Champion 2000+ Juicer doesn't require nuts, bolts, screws or clamps. A large feeding chamber reduces prep time by eliminating the need to cut vegetables into smaller pieces. MSRP $259 Based on the Manufacturer's Suggested Retail Price, this juicer is more expensive than average and is priced in the top 28% of juicers. Juices Greens Like many other juicers, this appliance cannot handle wheatgrass and other leafy greens. If you want greens, see the list of masticating juicers. 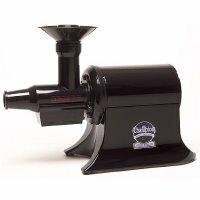 Star Rating 3.9 User reviews, ratings, and feedback indicates that this juicer is rated about average by 27 users when compared to other juicers.